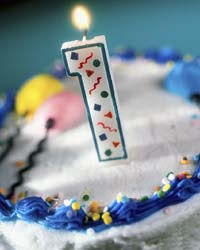 Well it doesn't seem like it, but Digitology is 1 year old today! For the last year I have tried my best to entertain, educate and share the best bits of what I consider to be Digitology - Digital Marketing, Digital Arts, Digital Technology or Digital Design (though I also like to include a few wild cards every now and then). 365 days / 8,760 hours / 525,600 minutes later, and here I am. Not bad that this is my 478th blog post - that means I blog at a rate of 1 blog per 18.5 hours (God I have too much time on my hands - though I do most of my writing in the wee hours of the morning). I feel like I should have some sort of epiphany or revelation but to be honest, I'm just happy to know that I (hopefully) make a positive contribution to the blogosphere. I'll have a quick run through of stats from Digitology for those that are interested and I'll share some of the things that I've learned about bloggin in the last year. Bare in mind I only put Analytics in place 3 weeks after I started Digitology, so stats are very slightly off. So what have I learned about blogging? Blogging is, above all, about conversation. It drives creativity. It drives innovative thought. It drives thinking. Bloggers generally share exactly how they feel. Read a blog and you should get to know someone, even if you've never met them - though you should try and meet them, because every blogger I've had the pleaseure to meet has been inspiring. If I could recommend that you do one thing, it would be visit every blog that I have in my blog roll (Digitology Follows...). These are the people helping to turn the cogs and wheels that make it all go around. I'm just happy to provide something that people find interesting. I dropped in the stats as it seemed like a thing to do reviewing the last year; to be honest I've no idea how they stand up (from a blog point of view). Happy Birthday Digitology! Very impressive first years of blogging - keep it up! Cheers Richie - I can't believe it's been a year (even longer contributing to Cybercom) - who knew I'd become a blogger? Fairplay Christina, I am glad they gave you the day off for your Blog's birthday! Lol unfortunately Stephen I had to book my own day off.